Just shy of two years old, Lucas Steakhouse has closed. I heard the news last week from my colleague Mackenzi from We Heart Astoria as well as from a loyal Foodista reader, Aaron. Walking by last weekend, Aaron noticed a sign on the door that said Lucas has closed its doors for good. 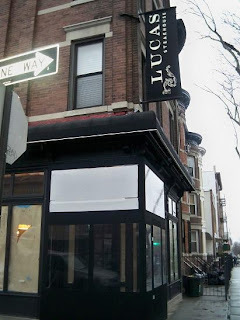 Although I feel bad for the misfortune of a local business, I can't say I'm surprised, given how expensive Lucas was, considering the neighborhood. I would much rather visit Christos Steakhouse on the rare occasion that I would eat at a fancy steakhouse. And apparently, I wasn't alone. So long Lucas. I hope that something else wonderful pops up in your place.